Disclaimer: I purchased this lingerie with my own money and Amoralle did not request a review. This blog post contains affiliate links. Amoralle is a relatively new discovery for me – I first mentioned them on the blog in March 2013 just after coming across their luxury lingerie and nightwear range. The piece I featured was their incredible Diamond robe, which at just over £300 I couldn’t afford but I’d had it in my mind ever since, and when I spotted that Amoralle was having a huge clearance sale and that this robe was 80% off I totally couldn’t resist! The robe was pictured over this black bodysuit and the description said that the bodysuit wasn’t included, but when the robe arrived (just a handful of days later despite coming from Latvia!) the bodysuit was in the box too. I’m not sure if it was a mistake in the product description or a mistake whilst packaging, but either way I’m not complaining, particularly as the bodysuit is a hundred times more practical for my lifestyle – I don’t get much chance to flounce around the house in glamorous robes with a newborn baby around! The Diamond robe has now sold out, however the bodysuit is still available and there are some similar robes available in the Amoralle clearance sale which will be ending any time now (it was supposed to end yesterday but right now is still going) – links are at the end of this review. 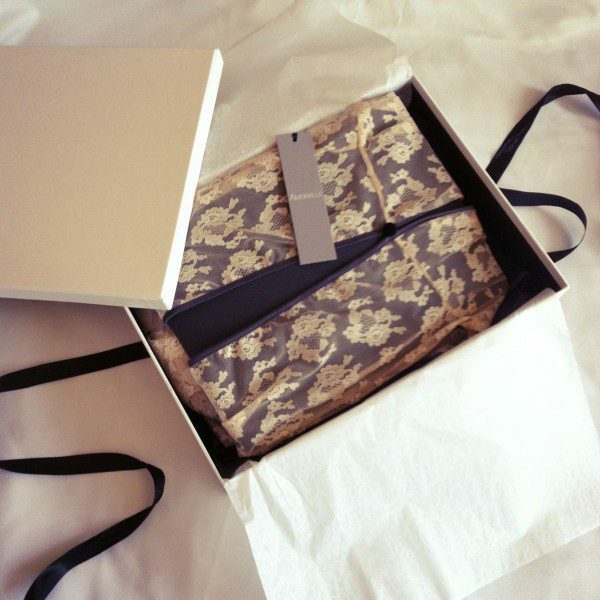 First things first – the lingerie arrived beautifully gift-wrapped! Neatly folded with card and tissue paper, the robe, satin belt and bodysuit all came in a really sturdy white gift box with a ribbon that will be perfect for storing them long-term (it’s not like those flimsy, single-use gift boxes some luxury brands use – Agent Provocateur, I’m looking at you). The robe is made from sheer cream lace with a sheer black chiffon hem, trimmed down the front with slightly shiny grey elastic and finished off with two velvet buttons to fasten it at the neck and waistline. It also comes with a long satin ‘belt’ (basically just a long strip of fabric to tie in a knot or bow as you want). I’ve been in love with this robe since the moment I saw it online and in terms of appearance it certainly lived up to expectations. It looks gorgeous and very, very expensive! The great thing about the robe (and about most Amoralle robes) is that it’s the perfect crossover between underwear and outerwear – if you popped a plain cream or black slip dress underneath this could double up as a glamorous evening dress or perhaps daywear for a special occasion like a wedding. The bodysuit is a simple, strapless design in stretch jersey – it reminds me very much of Maison Close which is another favourite brand of mine. There’s nothing fancy about it but sometimes simple is best, and this is a nice, sleek bodysuit that looks great under the robe but also worn on its own. Like the robe, it could even be worn as outerwear underneath a flowing maxi skirt to dress it down or trousers and jacket to dress it up. Overall, I really couldn’t be happier with how this set looks! Not much to say in terms of the bodysuit and the robe itself except that they’re beautifully constructed. As for the belt that comes with the robe, it’s lovely but I wish it were a little less wide – it’s supposed to have that sumptuous, oversized-bow look to it when tied but the width made it so thick I was struggling to tie it in even a knot without it looking bulky. The fabric of the robe is mainly cream lace, which looks lovely but it’s not very soft; it’s not scratchy, but it is pretty stiff so the robe isn’t as ‘swishy’ as I was expecting. As mentioned, I got this at 80% off and I’m more than happy with it, but if I’d paid full price I would have been disappointed at the quality of the lace. The stiff lace, polyester tulle trim and single-sided polyester sash just don’t scream ‘luxury’. I bought a size small which according to the Amoralle size chart is equivalent to a UK size 8. It’s ever so slightly loose at the bust but the waist fits fine. The main problem for me is the length – I’m quite short at 5’3 and the robe bunches up a bit at the floor. I need to wear 4″ heels for it to be just skimming the floor and they’re not something I tend to wear for lounging around! The bodysuit is made from a very forgiving stretch jersey that fits perfectly and would be fine whether you wear an A cup or a G cup. It may just be my new favourite thing to wear under strapless dresses. 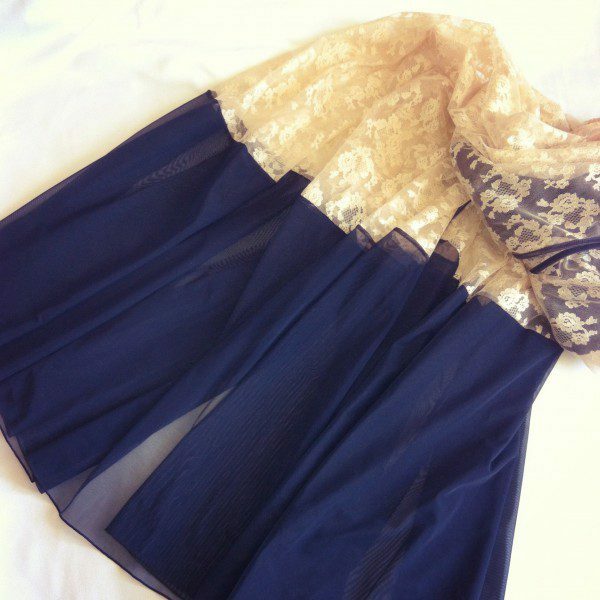 However, it does have a habit of slipping down after some hours so if you’re planning to wear it as outerwear I would definitely advise holding it in place with a little lingerie tape! The robe and bodysuit both say to hand wash them at 30 degrees. The bodysuit and the robe’s belt are probably fine to pop in the washing machine on a delicate cycle but you really don’t want to be machine-washing the robe with all its lace and super-fine mesh. I’ve washed the bodysuit a couple of times and it leaks quite a lot of dye so I’d definitely recommend washing it separately from the robe, and separately from anything else that isn’t black. I paid €72 which is around £60 (with free postage!) which was 80% off the original price. Based on what I actually paid, this is extremely good value for value – possibly the most luxurious-looking thing I’ve ever bought with £60! I love that it’s so many looks in one for such a small price too – the bodysuit as lingerie, the bodysuit as outerwear, the robe with the bodysuit, the robe on its own or over other lingerie, the robe as outerwear… What more could you ask for for £60?! At this price, totally! It may not feel luxurious, but it sure looks the part. Unfortunately as I mentioned, it’s now sold out but Amoralle also has a very similar robe called Lava Stone in sheer mesh with a silky jersey trim on sale for around £207 and an incredibly glamorous White Opal robe with floor-length, kimono-style sleeves on sale for around £233 in the same fabrics as the Diamond robe. The bodysuit is available to buy separately here. What do you think of Amoralle’s lingerie? Would you wear a robe like this one?